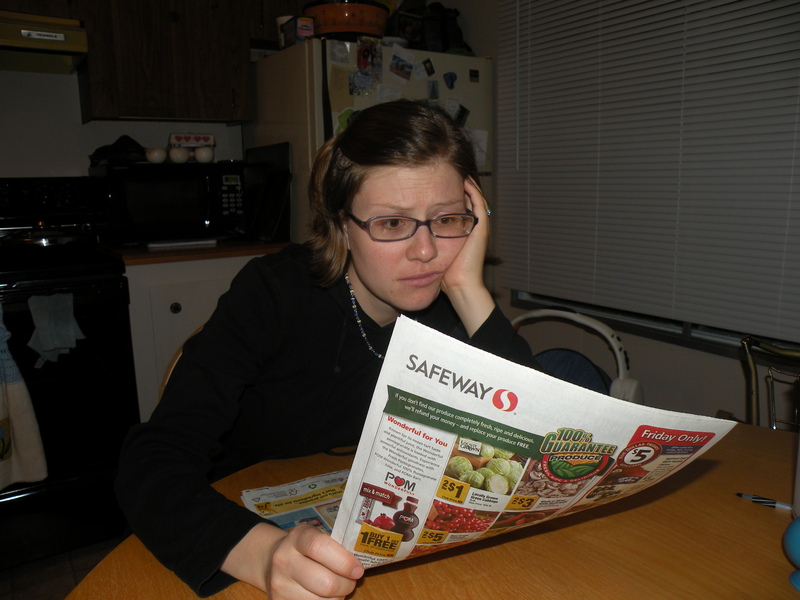 I don’t know about you, but my most frustrating shopping experiences happen at the grocery store! It never seems to fail that when I think I have about $50 worth of groceries in my basket, they add up to $100. I really don’t think that the problem is with my addition skills, I am sure that there is an evil gremlin in the checkout register that adds a dollar to everything I purchase! I love the savings cards that you get at stores like Safeway because when I swipe the card, I see the total price fall about $10. That always makes me feel a little bit better about life; its my revenge on the gremlin. Unfortunately the evil little gremlin always wins out, and the amount debited from my bank account is higher than it was supposed to be. Grocery shopping is an endless frustration for me. However, I have found valuable help in the book America’s Cheapest Family by Steve and Annette Economides that has helped make grocery shopping and grocery budgeting much easier. This book has a very high standard, they calculate $50 a month per person. By following the principles in this book, I am supposed to be able to feed Brandon and I on just $100 a month, and this includes eating meats and cheeses, fresh fruits and vegetables. I have not been able to bring my grocery budget down that much yet, but I am getting closer. I thought I’d share some of the grocery shopping principles that I have learned, and if any of you struggle with sticking to a budget at a grocery store, or if you also would like to take revenge on the evil register gremlin, perhaps these methods will help you as well. 1) Make a Menu Plan. Menu planning sounds rather overwhelming if you are a very busy person or just don’t enjoy planning, but a menu plan can take as little time as 10 or 15 minutes to simply jot down a few meals you’d like to make for the week. Planning a menu doesn’t have to be an elaborate affair. I usually plan to make 3 meals during the week. By the time we’ve eaten those 3 meals, we usually have leftovers for another night and enough ingredients to make a 5th meal during the week (and after that we have a long list of friends, relatives, and distant relations we enjoy visiting on weekends). By menu planning, your shopping will be more focused so that you don’t just randomly pick ingredients that look good at the moment, and then you will be able to save $ at the register! 2) Shop as Infrequently as Possible. Every time you shop, you are tempted by impulse buys, so the less you shop, the less you will be tempted. The Economides shop once a month, because they have a deep freeze and plenty of storage space. Most of us do not have such luxuries, but you can try to cut down your trips. If you have been shopping twice a week, try going just once. Or if you go once a week, try going every other week. This takes a little more planning, but out of all the tips in this book, this method has helped me save the most at the checkout (does this mean I am a very impulsive person or I am just easily tempted?). 3) Check Sale Fliers. Your local grocery store, like Safeway or Krogers, will feature certain items at really low prices as an incentive to get people in the door. Then make a menu plan based on the sales. For example, last week chicken breasts, thighs, and drumsticks were on sale for 99 cents a pound. So I bought about 5 pounds of chicken breasts and we will be enjoying Parmesan Chicken, Chicken Oreganato, and Honey Glazed Chicken (or at least that is the hope…the meals have yet to be made!). Chuck Roast was also on sale for $2.00 a pound, so I also purchased several pounds of roast and divided it into several different meals. I now have enough meat to feed Brandon and I for about two weeks of meals for just over $10. Watch for deals in other areas as well. For example, the other week grapes were also on sale for 99 cents a pound, so we enjoyed grapes with our lunches for the next two weeks! This week bacon was on sale for $1.99 for a one pound package, so I stocked up on that for breakfasts. The grocery gremlin still thwarts me at every chance he gets, somehow marking up prices by the time I get to the register, or sneaking extra items in my cart (I swear I didn’t put those Oreos in my basket!). But I am learning and someday, I shall be victorious! Thank you for inspiring me to get a little more serious about grocery shopping! With feeding a family of 11 currently in my home, grocery shopping is not fun. What I have found is knowing my prices and sticking to a plan as to what I will not pay more than $$$ for certain foods. Not too long ago I refused to pay more than $1.69 for a pork loin. I would wait until it hit my target price before purchasing it. Same goes for boneless skinless chicken. Boneless chicken is a quick meal waiting to happen. Knowing when sales are and stocking up is helpful. Sometimes making a menu from just what we have in our pantry instead of shopping for the week. One week I might stock up on tomato juice if it’s on sale and then a couple of weeks later I might use it then for chili or taco stew. I guess the biggest factor is knowing your prices and what you can do without until it hits your price. I know prices have gone up in the past years. It is really difficult to stay within your budget in crunch time. Just stick to it and be patient. Get creative with what you have on hand. Find time to search the internet with what few ingredients you have to use. Use your children’s suggestions for meal planning. We sat down during dinner and I asked the children what meals they liked. From that list I created my menus. That way if there is one favorite meal the children liked they would get it sometime in the future. My best tip is to make shopping a game. It is fun to see how much you can save and what a bargin you can find! Here is my two cents-it helped us. First off, if you can find a local farmer, and have an extra freezer, we purchase part of a cow. The cow we get is hormone free and comes from a local farmer. We can see the cows in the field and know exactly where it has been and what it was fed. This saves us a lot on our meat bill! It gives us steaks, roasts, hamburger, and stew meat. It will feed our family for a year. Knowing your prices, using coupons, and buying when items are on sale is the best way to save money. Our local Amish also have a bent and dent store. It has items close to out of date, but some items with a date really don’t matter. A dented box is no big deal-as long as it didn’t open the product. Coupons-especially on double coupon day. For items you buy regularly, most manufactures put coupons on their web site online. A quick google search is worth the time. The other day we found butter on sale-we bought 15lbs. Christmas baking is coming and it stays well in the freezer. When chicken goes on sale (hind quarters and legs) I buy about 40-80 pounds and can the chicken. I have shelf room and it great for soup and chicken salad! To save around the house, we also make our own laundry soap…that saves a bunch! We do not use the dryer, as I hang all our clothes. We keep the heat in the house about 62-64 all winter, and if we are gone for the day it gets turned down to the 50’s. It is amazing how quickly you aclamate to the temps. Our children are limited to the shower time, and each have their own towel for the week. One more thing. I like to put meals in the freezer for nights that are full or that I don’t really feel like cooking. If I make one chili, then I double it and put half in the freezer, same with lasagna, stews, etc. Ground hamburger or seasoned for tacos is a good staple too! One thing that I have found that has seriously brought my grocery budget down is to buy in bulk. This is easiest for my by using Azure Standard as a co-op source for bulk grain, seasonings, cases of canned goods, etc. Additionally, I make almost all of our food from scratch. An investment in a good breadmaker and grain mill will allow you to be able to make your own super nutritious and delicious bread for a lot less than store bought of comparable quality. Additionally, it is super simple to make your own mixes of taco seasoning, french onion soup, and all the other little packets that people pay between 50 cents and a dollar for at the superstore. Google recipes for whatever seasoning blends you like and then mix and store in an airtight container. Big savings, and you’ll avoid MSG and other nasty fillers that sometimes come in those packets. For the past year I have been switching my family to whole foods. Meaning no or very little processed foods (hamburger helper, frozen chicken nuggets, pies from the bakery area.) Instead we eat what you would buy from the perimeter of the store…meats, eggs, dairy, fruits and veggies. This has saved a LOT of money since we arent paying the high prices for fake food that gives little to no nutrition. And eating real foods doesnt have to be time consuming. Put a roast in the crockpot before you leave for the day. Put in some veggies when you get home. Let it cook 1-2 hours longer, make a simple salad and dinner is served! When I go to the store I only bring the cash I plan to spend (and a calculator). Then as I’m shopping, I keep track of the money spent and when I reach my limit, I’m done =) I find that I am ALOT more careful about what I put in my cart when I shop this way! If your plan includes some options using staple items, you’ll be less like to give up and go for the fast food joint. For instance, pancakes or waffles are fine for those busy nights when you just don’t want to think about fixing dinner so I always include several easy nights on my 2wk plan. Having a Master Mix premade will also help you decide to eat in. If it’s already made up and you don’t have to prepare a lot when you’re tired, you’ll be less likely to give in to the temptation of eating out. Your master mixes can be for pancakes, muffins, quick breads, biscuits, cream of whatever soup mix, etc. The biggest change we have made that has drastically changed our food spending is becoming vegetarians! I know it sounds really extreme but you could try one meatless meal night a week. We became really convicted that it was better for our bodies and our environment with a big bonus being that it is better for our budget. I thought my husband would be completely opposed to the idea but after I had done it for a month he decided he would try it for 2 weeks. The 2 wk period was almost 3 yrs ago and I have not bought meat since. We do occasionally eat meat when we are out or over at someone’s house but I don’t buy it for home. I have gotten really creative with it and I can make almost anything we used to eat just substituting extra veggies for the meat, especially mushrooms. My grocery store has a lot of BOGO items (Buy one get one free). When you use coupons with these, you get big savings! I also try to plan my menus so that I can get exactly what I need for each meal. In the past year, I have cut our grocery expense from $150-$200 per week down to $50-$75 per week. One of our biggest savings has always been the meat, eggs, and veggies we raise on our farm. However, I still have to purchase milk, cheese, grain, sugar, etc. I look for the sales at my local grocery store and accompany the sales with coupons. Last week I spent $25 on groceries at Kroger for about $125 worth of food and other items. I also shop at a closeout store in my area called United Grocery Outlet or UGO. They have fresh produce which is often organic at marked down prices. They also have cheese, butter, milk, meat, etc. at rock bottom prices. In addition, I take advantage of free offers either via the internet or using coupons at stores. Earth Fare (a health food store in my area) sends out a free coupon nearly every week! I get lots of great organic freebies from there! I also barter. For instance, I traded eggs for sweet potatoes or beef for cheese or milk. There are lots of great money saving websites out there which find the deals for you. Thank you for your tips as well!